Elliptical machines offer a total-body workout. If you're interested in getting in shape or maintain fitness, a stationary bike or elliptical machine can help. While they both build leg strength, elliptical machines with handles help build arm strength as well. Stationary bikes come in two basic models: a traditional bike structure with a saddle seat or a recumbent bike with a chair-like seat. Elliptical machines, which are meant to simulate walking, running or climbing, feature footpads that move in an elliptical pattern. Both machines are primarily intended to provide an aerobic workout. Both an elliptical machine and a stationary bike offer low-impact aerobic workouts, which means less stress is placed on joints because the body is not subject to the pounding of a high-impact activity such as running. The Cleveland Clinic notes that stationary bikes are particularly suitable for people with arthritis or other conditions that make it difficult to walk. A stationary bike also is appropriate for people who are 50 pounds or more overweight, since it puts less stress on the back, knees, hips and ankles. Strength coach Michael Boyle at Robertson Training Systems says a stationary bike is the best and safest choice for interval training. An elliptical machine combines a low-impact workout with a weight-bearing workout. Elliptical machines, especially those with handles resembling ski poles, give you a whole body workout that gets your heart pumping quickly. Riding a stationary bike is not a weight-bearing exercise, so you don't get the same bone-building effects you get from an elliptical machine. 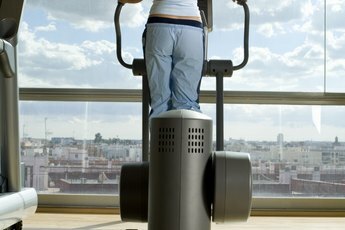 Working out on an elliptical machine is unlikely to cause pain in healthy knees if you use proper form and technique. Keep your head up, shoulders back and abs tight without leaning on the handles. 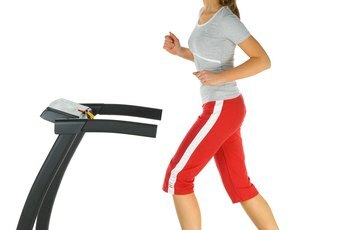 If you have an underlying knee problem, an elliptical machine could exacerbate it. Stationary bikes are better than elliptical machines for certain types of knee injuries, says MayoClinic.com. If you are recovering from knee surgery, rehabilitation may involve riding a stationary bike. If you have access to a gym, it probably will have both elliptical machines and stationary bikes. But if you are equipping a home gym, you may have different concerns. Stationary bikes are cheaper than elliptical machines and occupy less space. However, the Cleveland Clinic emphasizes that you should choose an activity you enjoy, since you're more likely to stick with that routine. Consult your doctor before you begin a new exercise program. Do Ellipticals Give You a Better Work Out?